Even if it’s counter-intuitive, the best design is often the simplest. Officials at Art Center College of Design were first skeptical of architect Darin Johnstone’s plans to transform the school’s “Post Office” building in downtown Pasadena into a new home for the school’s fine art and illustration departments—particularly given the building’s unremarkable, suburban office design, a $5.2 million budget, and a miniscule seven-month start-to-finish timeframe. But through clear and calculated interventions, Johnstone was able to create a space that is practical, inspiring, and, yes, cool. The 35,000-square-foot CMU and cement plaster building was originally built in 1979 for electronics manufacturer Digitran—which explains the large “D” cutouts on the corners—and was bought by the US Post office in 1995. 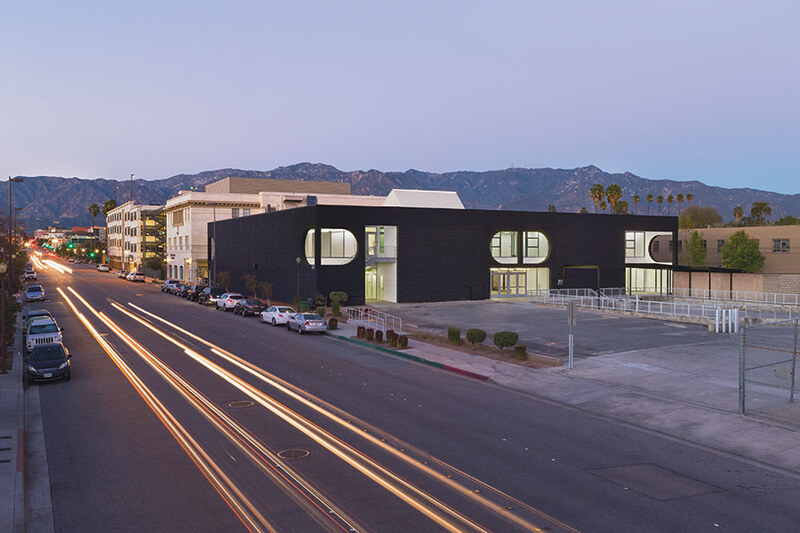 Job number one, said Johnston, was to “strip away the layers of odd decisions that the post office had made.” To transform the unremarkable facade he decided to paint the building jet black, a color inspired in part by Art Center’s iconic Craig Ellwood–designed main campus building. Interior galleries are painted white, as are the insides of the Ds, which create a dramatic visual contrast, emphasizing the building’s unusual architectural details and making it stand out in the sea of light-colored edifices around it. Replacing bulky loading docks and canopies that had become the building’s de facto entrance, Johnstone cut a large opening on the ground floor. 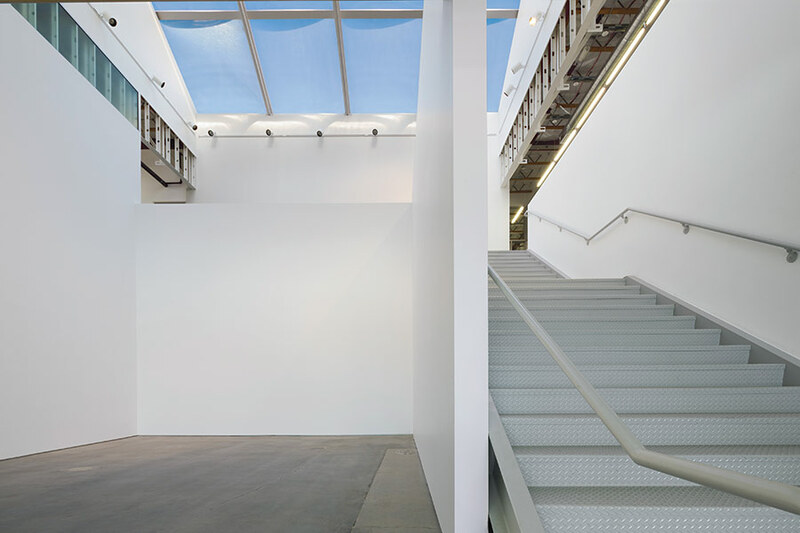 Inside, he took advantage of the building’s sky-lit double height atrium, converting the space into galleries, and connecting it to the rest of the building via a new grand stair with a metal mesh landing. 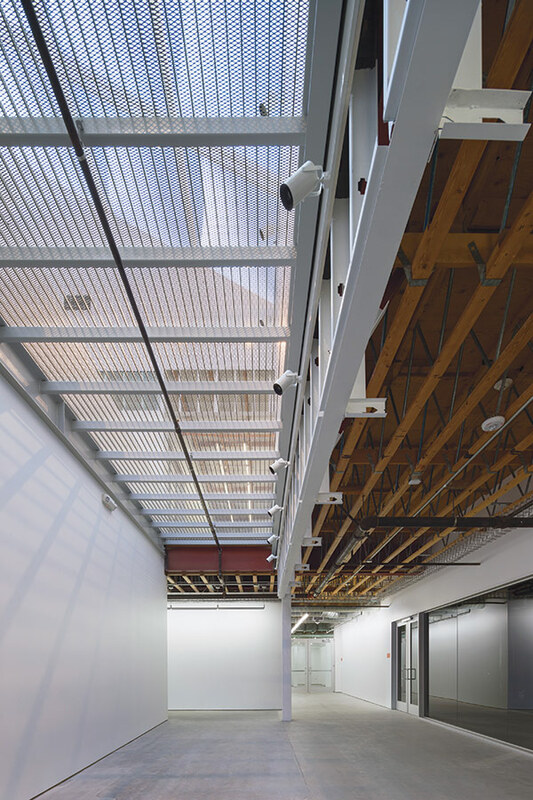 To bring light into the rest of the building, he cut into the atrium’s edges, and converted under-utilized circulation hallways into more galleries, bridging the gap to the structure’s existing corner light courts. It’s a process that Johnston calls “carving the space with light.” “The game really became how do you get access to light to all the spaces?” said Johnstone. Student studios and classrooms located along the building’s edges take advantage of this humane connection to light and space, and have been treated with extraordinary attention to detail. “We wanted to create a gallery-like setting for the studios,” said Johnstone, who is currently working to retrofit another building down the street—a former office—for Art Center. 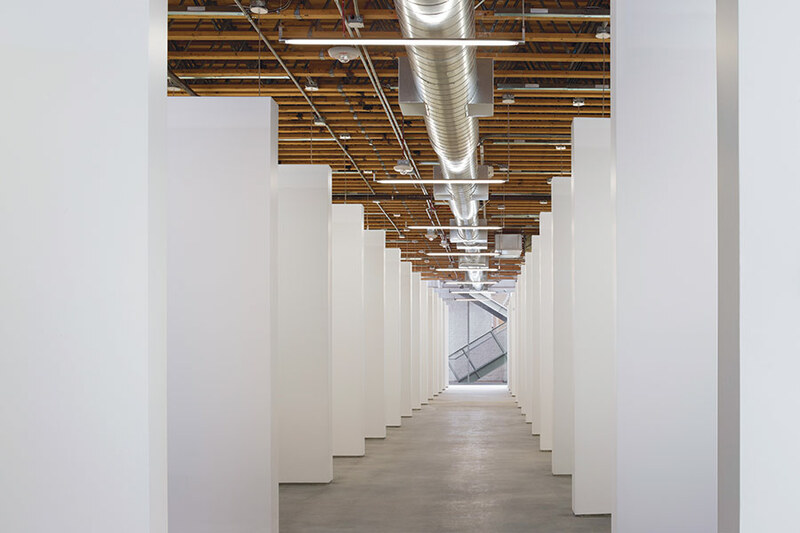 Clean white gypsum board—lining learning rooms and partitioned studio spaces—is contrasted with exposed structural materials and mechanical systems. Thin hanging gallery lighting emphasizes the feeling of subtle refinement. 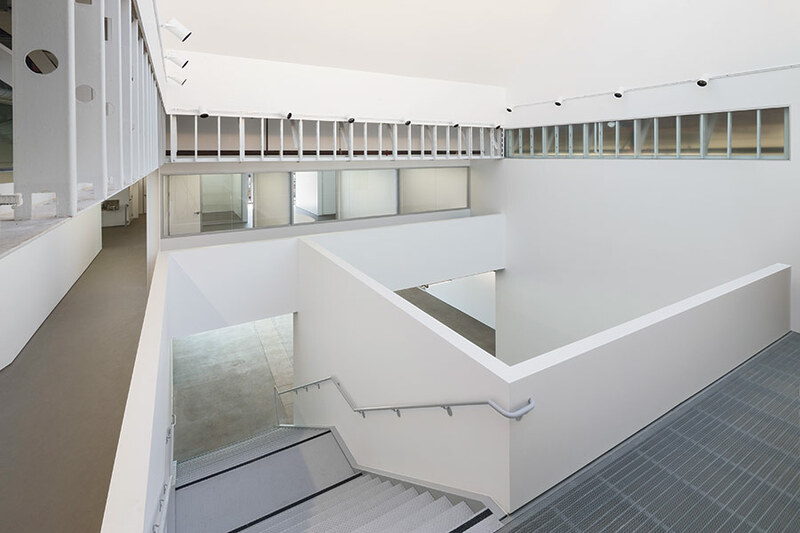 Meanwhile, second floor administrative spaces, above the entry, are glassy and open, connecting the exterior to the internal galleries visually. In fact you can see through these from the parking lot into the internal atrium. Overall it’s an approach that reduces architecture to its purest, most powerful elements: light, space, and volume. Without other distractions those qualities feel particularly strong here, and they vividly enhance the building’s purpose: viewing and creating art. Johnstone developed an installation inside the atrium’s first floor, called Drawn Out / Light Mass. It converts the project’s plans, diagrams, and axonometrics into a three-dimensional experience, altering them into an angular scrim, printed with angled lines. Looking at the architect’s drawings on the wall of the gallery it gives you another chance to understand how he didn’t need to spend excess time, or money, to implement a clear, unified idea, which has transformed a once-unpleasant space from unordered cacophony to intelligent design. And it reminds you that simplicity can still be quite dramatic in itself. The building’s dramatic black facade; below the atrium landing; a line of studios; atrium gallery.